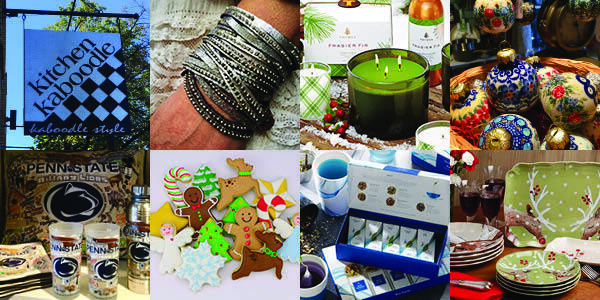 Join us for our Holiday Open House and Presh Trunk Show on Sunday, November 19th. Click here to learn more! Located in the heart of downtown State College, just off the corner intersection of Allen Street and Beaver Avenue, is State College’s premier kitchen, home and gift store, Kitchen Kaboodle. Named “Best Place to Buy a Gift” in 2017 & 2016 by readers of State College Magazine, Kitchen Kaboodle has been locally owned and operated since 1983. This unique destination is frequented by locals and visitors alike because it is never the same experience twice. Katie Dawes, owner since 1987, goes out of her way to have ever changing inventory that is chic, trendy, seasonal and wonderfully uncommon. “If I wouldn’t buy it myself, then I don’t make it available to my customers,” Dawes says. “One of the greatest compliments we receive is when a customer says, ‘This store always seems new and different!’ Hearing that makes it all worth it.” So, what is “it”? “It” is the friendly, personal staff and their knowledge about every item in the store that makes the customer service experience special. That, paired with Dawes keen sense of style and her effort to stay fully engaged in the ongoing, prospective merchandise hunt makes Kitchen Kaboodle a treasured part of our quintessential college town. Kitchen Kaboodle is for the culinary curious. The shop is loaded with cookware of the highest quality from All Clad and USA, as well as kitchen gadgets and tools, small appliance such as slow cookers, pressure cookers, espresso makers, and everything in between. Other top brands include Wusthof, Swiss Diamond, OXO, Capresso and Nordic ware. Home entertainers and gift givers alike love to stop in regularly to see seasonal linens, candles, unique home furnishings and accessories that can’t be found anyplace else in State College. Nora Fleming, Casafina, and Mariposa are among the customer favorites. 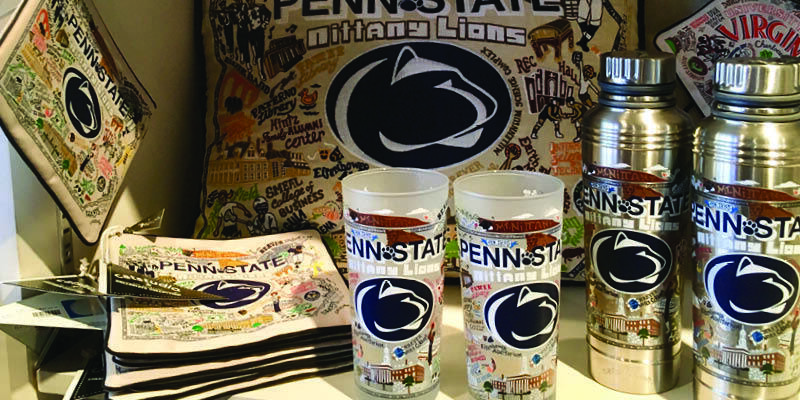 Home decorators love the collection of Cat Studio products that include state, city, country and collegiate themed drinking glasses, kitchen towels and embroidered pillows. Katie Dawes and her team were instrumental in assisting with the design, creation and licensing of the Penn State Cat Studio design. Additionally, a State College Latitude and Longitude Collection is another new favorite in the shop made exclusively for Kitchen Kaboodle by Eric & Christopher. Gourmet foods that include some made locally, fashionable aprons, teas, cookbooks, Ariston olive oils and balsamic vinegars and other essentials keep customers coming back again and again. 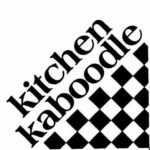 Kitchen Kaboodle is so much more than a kitchen store – it is Kaboodle style! Visit our new website for a special Holiday Offer!